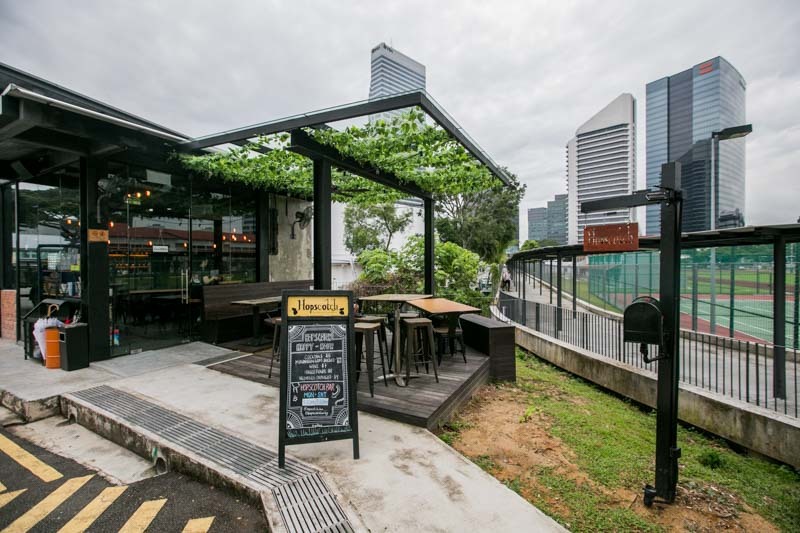 After a year-long hiatus, the folks behind Mixes from Mars are back once again with The Grand Reopening of Hopscotch in their newest hideout at Gillman Barracks. 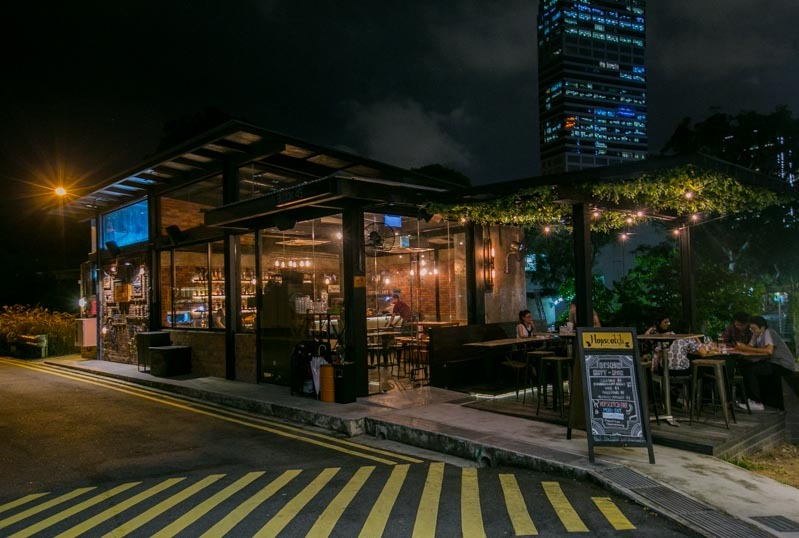 With the chill and laid-back vibes of this place, we guarantee that this will soon become your squad’s favourite haunt. Originally a pop-up bar in the courtyard of Red Dot Traffic Building (now Maxwell Chambers Suites), this bar serves up some pretty innovative bespoke cocktails ($20 – $25). To start off on a lighter note, we had the White Sands ($24). This tropical cocktail instantly transported my mind to those carefree days spent at the beach unwinding. 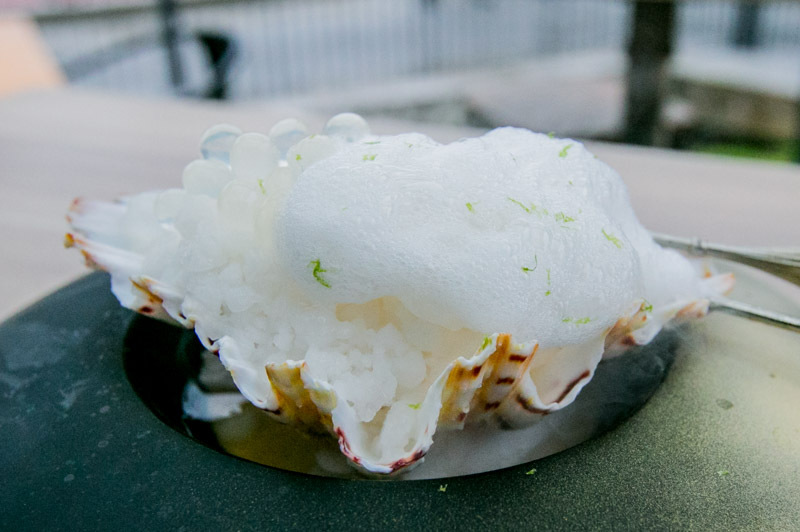 Served on a seashell, the cocktail is a refreshing mix of Kwai Feh lychee liqueur, homemade coconut sorbet, Nigori sake and fresh citrus blended with dry ice — giving it a smooth, velvety finish. As if that does not sound tantalising enough, the drink is topped with white chocolate foam and lychee spheres. 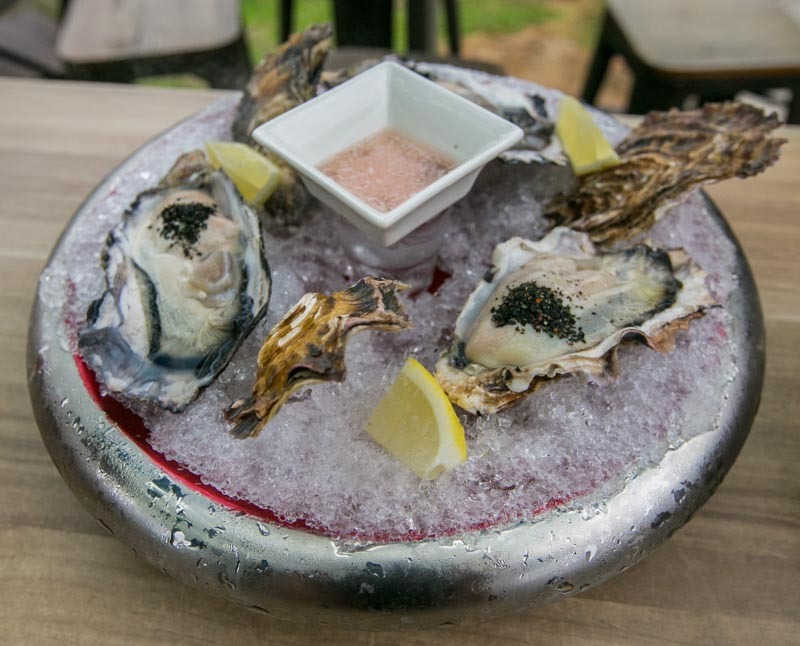 While you’re at it, have a go at their fresh Hyogo Oysters ($12 for 3 pieces). 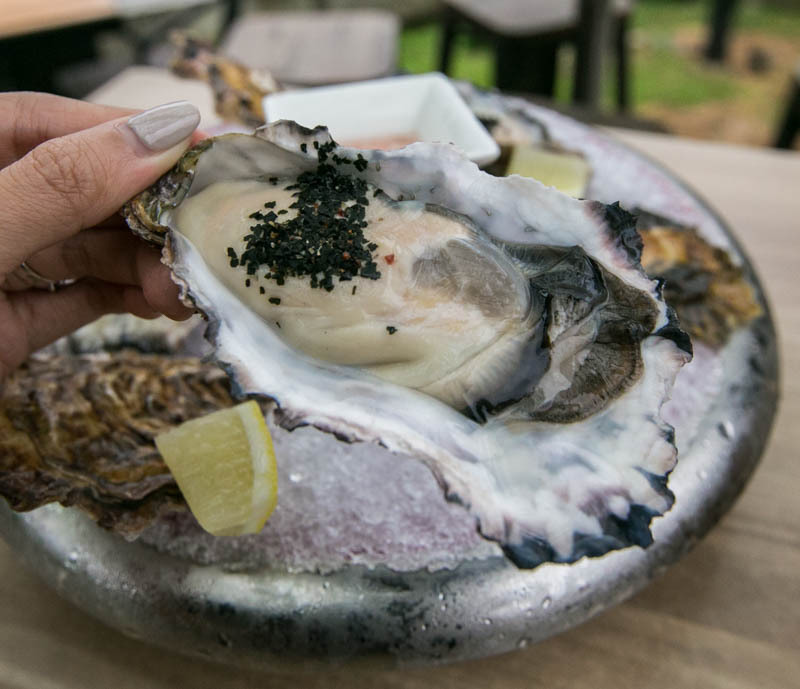 These plump and juicy oysters air-flown from the Hyogo prefecture in Japan are served with dashi and kombu (kelp) soil. As dusk approached, the inner-alcoholic in me was beckoned to come forth. Wanting something a little stronger, we dived into the Ice Man ($23). 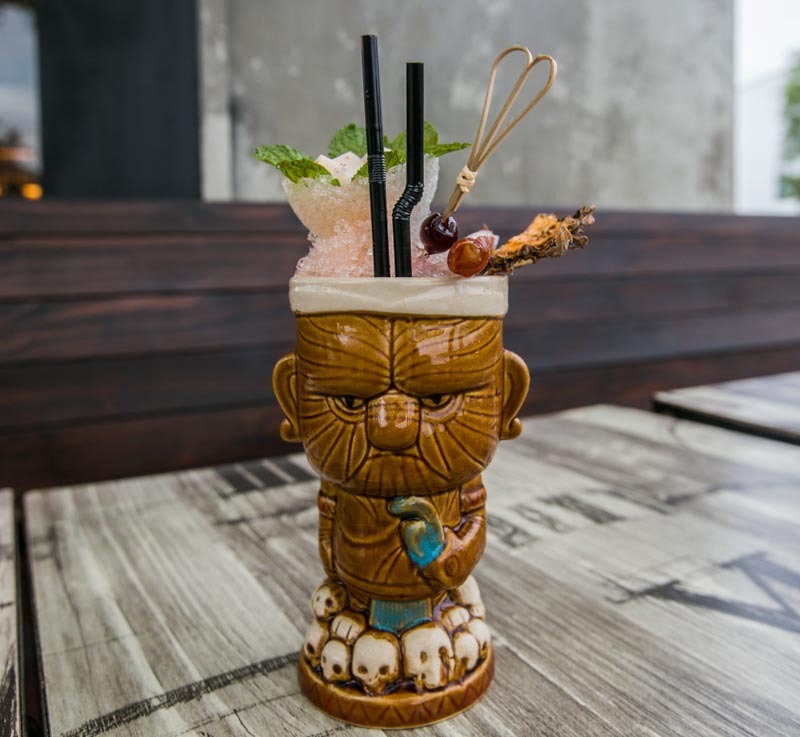 With Abuelo Anejo dark rum and Peach Schnapps as its base, this cocktail is served in a cute Tiki mug. Fresh calamansi and citrus are infused into the drink and it is served with almond jelly, mango roll-up, dehydrated pineapple, Amarena cherry and Angostura and orange bitters mist. 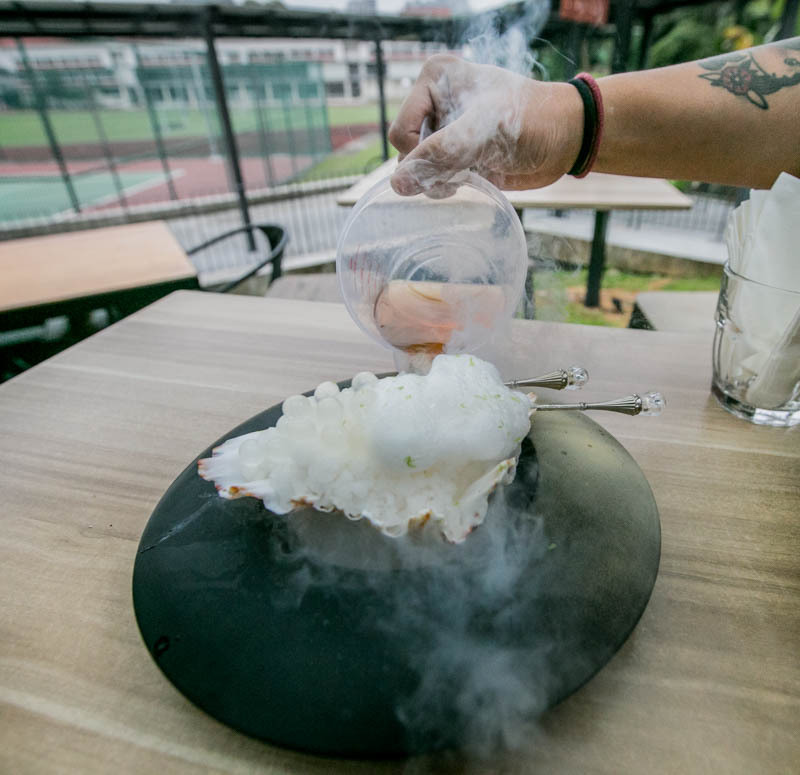 Inspired by old-school Singaporean shaved-ice desserts, we were told that this drink pays homage to the “uncles from the traditional dessert store”. What’s a booze-filled gathering without some satisfying bar bites? 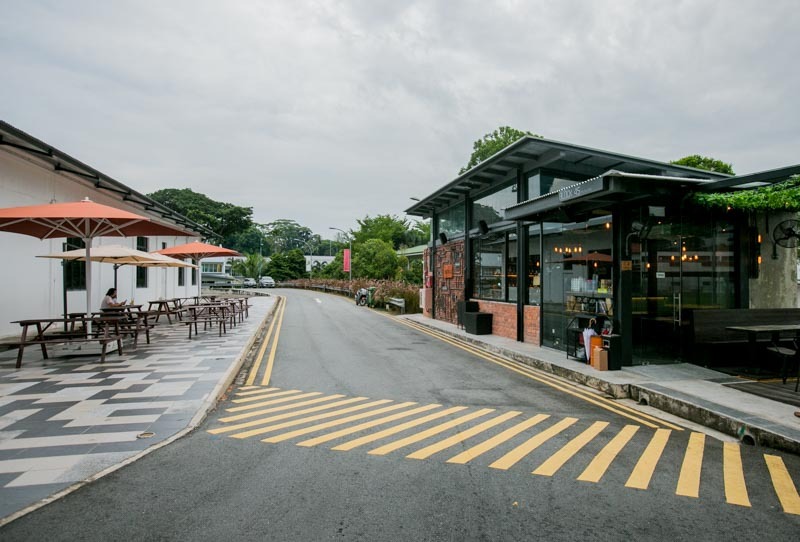 To the folks at Hopscotch, barbecues are a symbolic rite of passage most Singaporean teens go through, a step to forging deeper bonds with friends. 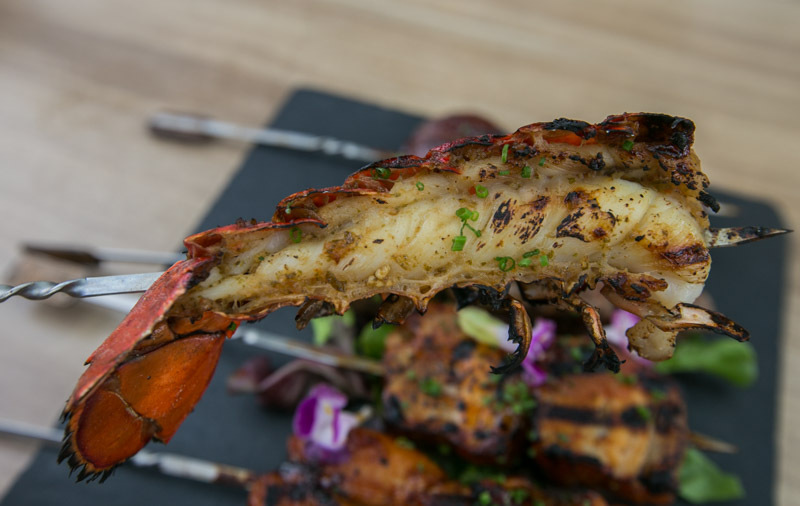 From chalets at Downtown East to poolside parties at our friend’s condo, a must-have is always the barbecue. As such, they wanted to evoke nostalgia by offering the same experience sans the mess and unpleasant odour of grill-smoke lingering in your clothes and hair. 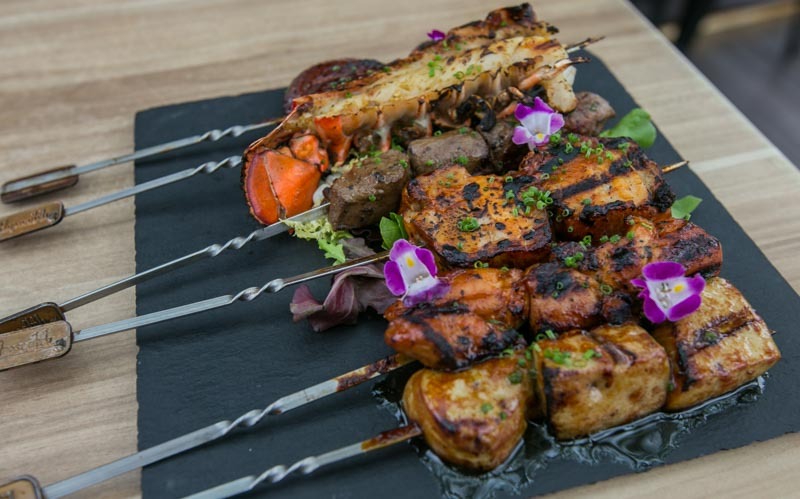 We caught a whiff of the mouth-watering, robust smoky aroma from the delectable platter of barbecued Skewers ($1.50 – $12.90) even before it reached our table. 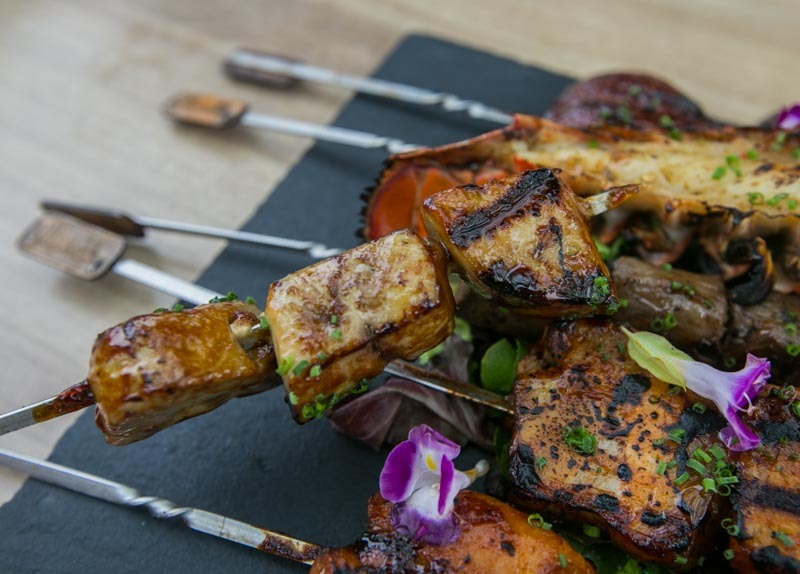 Lightly charred on the outside but succulent on the inside, each of these skewers is coated with their special homemade glaze and grilled to perfection. 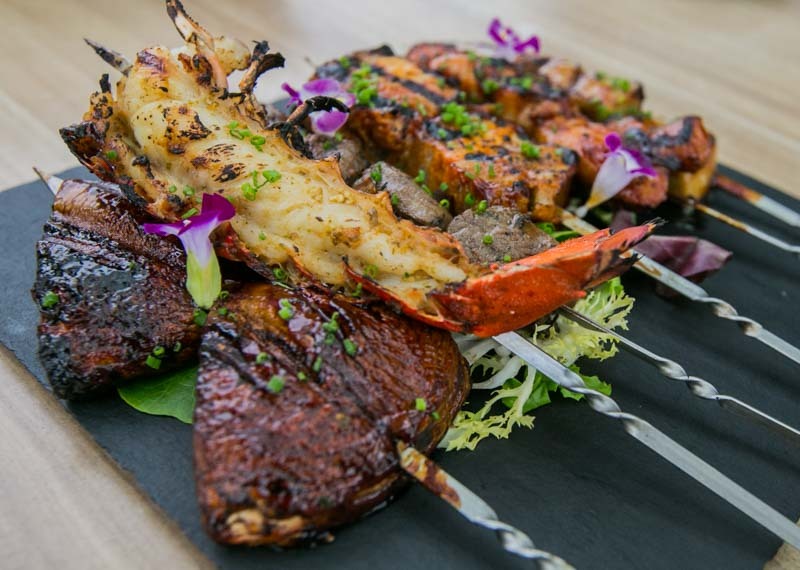 Other than the usual suspects such as Chicken Thigh ($3.20), Pork Cheek ($6.90), Flank Steak ($4.90) and Portobello Mushroom ($5.90), if you’re feeling indulgent, you can even go for the rich and decadent Foie Gras ($12.90) or indulge in the Spiny Lobster Tail ($12.90). I’ll just leave you with this: it’s definitely worth the little splurge. With all the sinful grub, you would probably want something warm and soothing to cleanse your palate. Sinseh’s Mulled Wine ($21) might just do the trick. For the unacquainted, mulled wine is a spiced, alcoholic drink that is served warm. 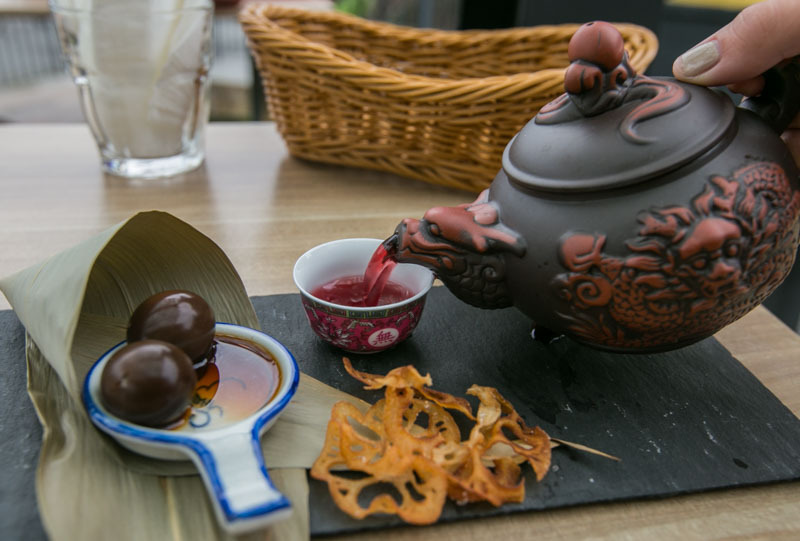 In Hopscotch’s variation of this traditional festive drink, they add an Eastern twist to it by infusing Chinese herbs and spices — such as Assam black tea, Angelica, red dates and goji into the red wine. It is served alongside crispy lotus chips and tea leaf quail eggs. With our bellies warmed up, we moved on to the mains. First up, was the Smoked Beef Brisket ($14 for half rack). 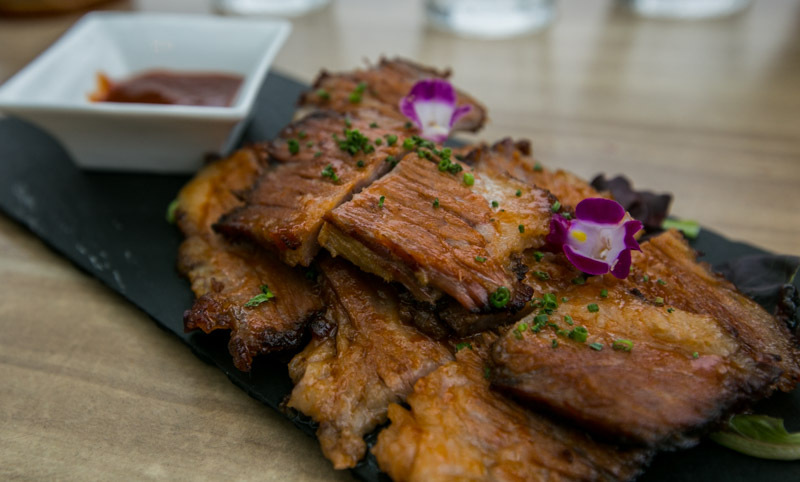 The glorious slabs of beef briskets are smoked low and slow, allowing it to lock in the savoury juices. While it was already amazing on its own, I would suggest dipping it in some of the barbecue sauce for a more harmonious combination of flavours. 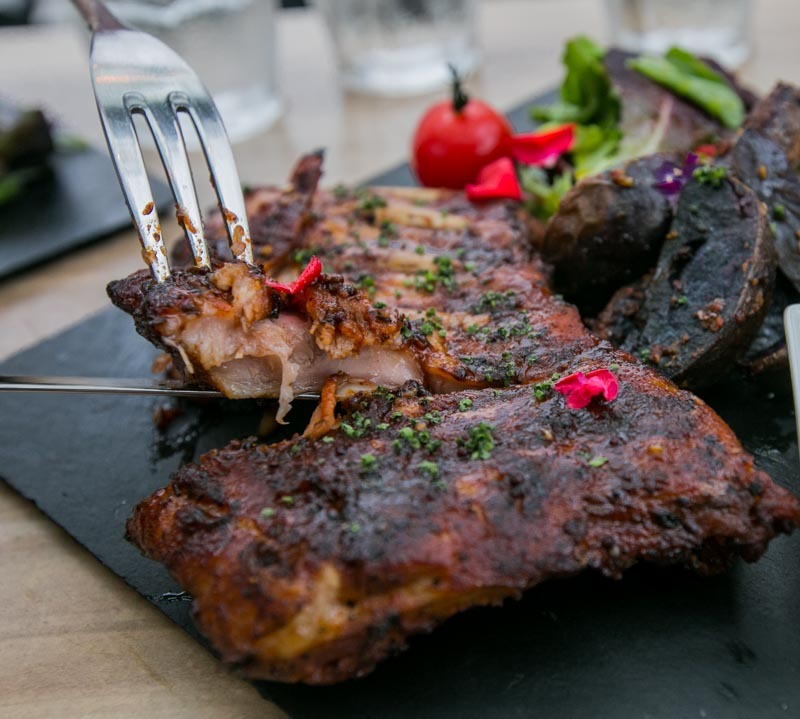 Next up was the Baby Back Ribs ($24 for half rack), which features half a rack of tender baby back ribs served with baked purple potato wedges and mango chutney. Doused in their house special spice blend, the fork-tender ribs are sous vide before being finished on the hot grill. The end result? 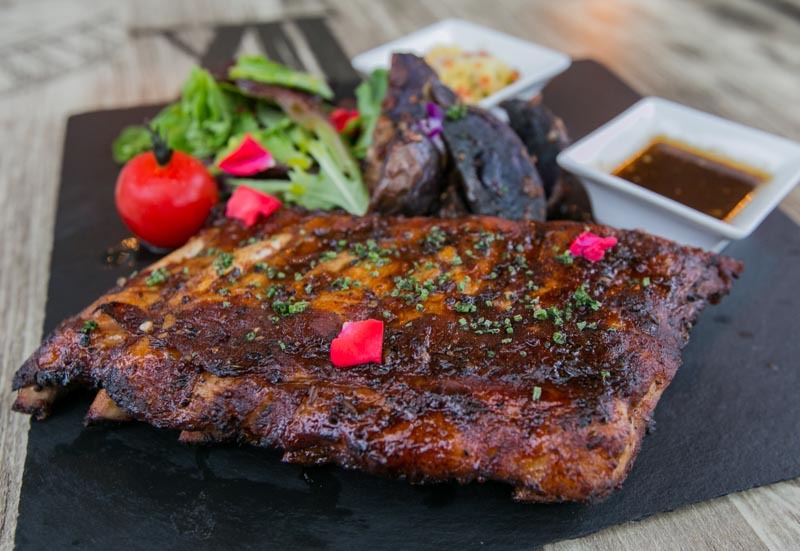 Juicy, melt-in-your-mouth meat that is masked with a prominent smokiness and falls right off the bone. 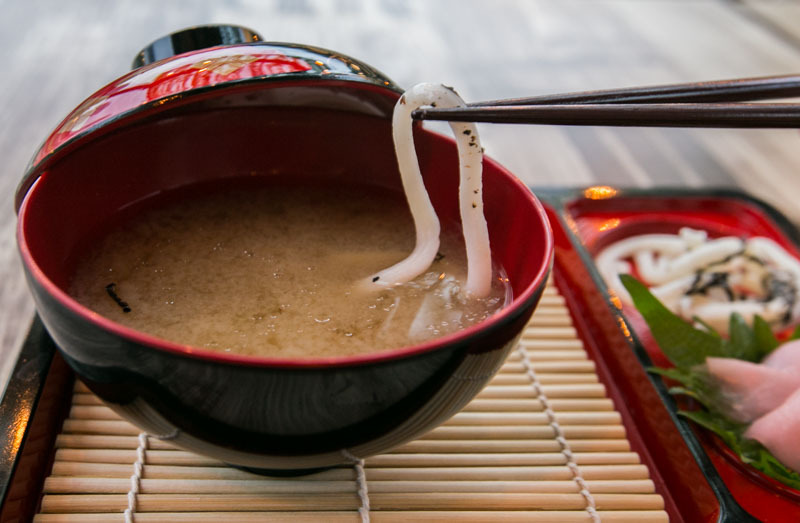 How about a piping hot bowl of miso soup and udon to end off the meal? Deceiving in its presentation, the Lunchbox Special ($22) is actually made up of furikake-infused sake, vodka, chicken miso and mirin. It is served in a bento box, together with truffle udon and pickled ginger. Have a sip of the “spiked” miso soup before dipping the udon in it, for a different experience altogether. It was light yet complexed at the same time, but one thing’s for sure — I’ll never look at Japanese lunchboxes the same way again. 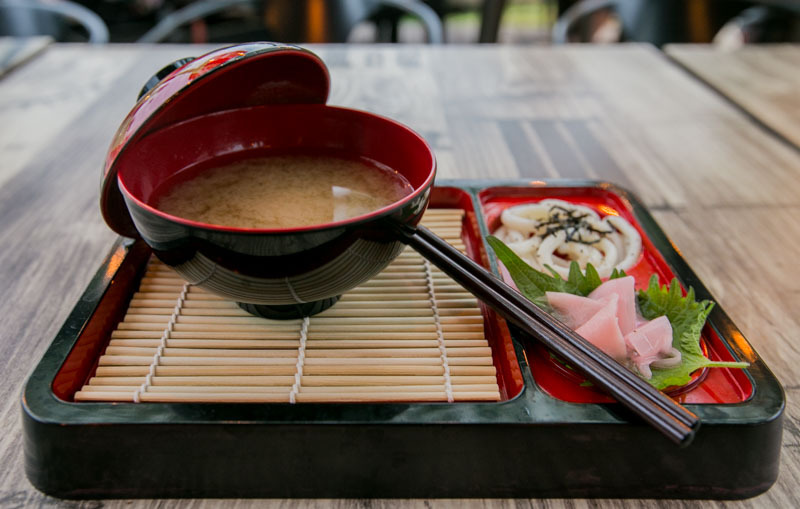 It’s definitely not going to feel complete without this comforting bowl of alcohol-infused miso soup. And finally, one for the road! Regulars of Hopscotch Bar would be familiar with the Milo Shot ($6). 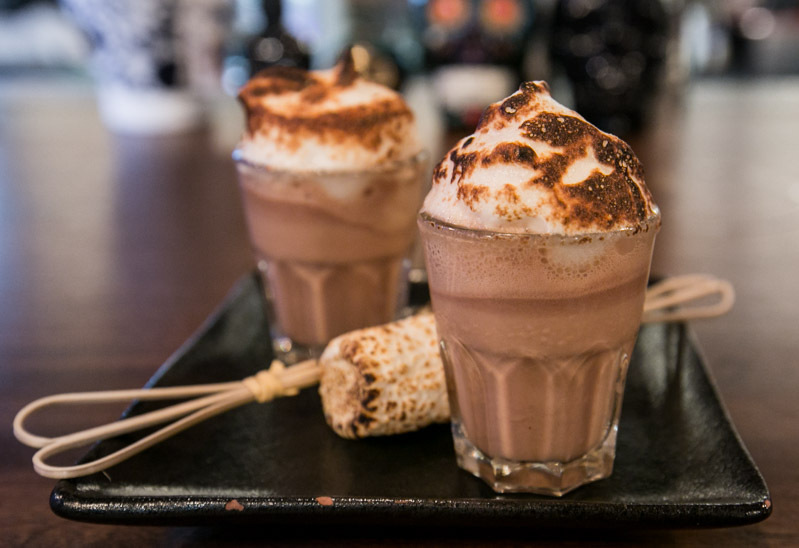 Think of it as an alcoholic Milo peng with the consistency of a milkshake, topped with toasted marshmallow. AND another toasted marshmallow on a skewer by the side, ’cos why not? That, after all, is the part many of us look forward to nearing the end of a barbeque — the toasted marshmallows. Mmmm. Don’t just take my word for it, head on down before everyone else hops on the bandwagon.